Housing Drawer Magnet finds usage in diverse fields like chemical industry, foodstuff industry, pharmaceutical industry, and feed stuff industry. 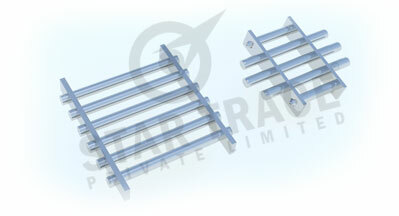 The Drawer Magnet consists of a magnetic filter bar with stainless steel satin finish. The magnetic filter bar is composed of permanent magnets and stainless steel tubes with special magnetic circuits. It is used in liquor industry to stop the iron or steel substances that pass through magnetic filter by attracting the iron or steel substances to the walls of the filter bars and magnetic cartridges, thereby ensuring safety and production of equipment and facilities. The magnetic filter bars are available in standard diameters of 12mm to 100mm. The dimensions of the magnetic filter and shapes of the frameworks can be varied on request. Drawer Magnets are mirror polished, brushed or sandblasted;. They are made up of stainless steel grade SS304 or SS316;. The drawer magnets consist of high-strength rare earth permanent magnetic materials;. The Operating temperature of the Drawer Magnets is 80 °C similar to conventional products, but can be made to withstand higher temperatures: 100 °C, 120 °C, 150 °C, 180 °C as per customer requirements,. The drawer magnet can withstand a maximum temperature of 350 °C;. The Drawer Magnets can be installed by round and square flange or quick clamp interfaces;. The design types available are common type and Clean Design for selection. It can also be designed according to customer requirements.